If you have a small sawmill producing high-quality lumber, you may have considered selling affordable lumber directly to customers building homes or structures. But before you can make your first sale, keep in mind that the wood will need to be graded and stamped. When you buy a 2x4 from the lumberyard, you may have noticed that it has a black ink stamp on it with some letters and numbers. The stamps mean that the wood has been inspected and approved for use as a structural piece in a home or other building. These stamps were introduced to maintain quality standards. Under the International Business Code (IBC), "Sawn lumber used for load-supporting purposes, including end-jointed or edge-glued lumber, machine stress-rated or machine-evaluated lumber, shall be identified by the grade mark of a lumber grading or inspection agency that has been approved by an accreditation body." Is a Grading Stamp Right for you? To sell lumber for construction purposes, you must have one of these stamps on your lumber. Pursuing your own stamp could open up doors for you to sell to a broader market. On the other hand, it can be a costly and time-consuming process and you may be happy selling wood products that don't need a grade stamp such as hardwood lumber, flooring, and molding. To get your own stamp, contact the approved accreditation body in your region to become a member. Trained Staff: Someone on staff at your mill must be trained in proper grading procedures laid out by the American Lumber Standard Committee (ALSC). They need to know things like how much bark is or isn't allowed on certain grades. 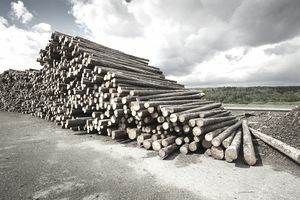 They will have to be aware of what moisture level is permitted in the lumber for each classification along with a few other characteristics of softwood lumber and how to grade them properly. If everything is in order, you will be allowed to stamp your own lumber and can then sell it as structural lumber. Inspections: You can expect your mill to be visited by the organization you got your stamp from. They will come by and inspect your lumber from time to time to see if you are grading your lumber properly. If they find enough errors they can hold up truckloads of material for inspection. It is best to always pay close attention to your grading and be sure you are grading your lumber correctly. It will cost you $250-$450 per week in membership dues, which is more than the average small sawmill owner can justify when making a few boards. Hire a traveling grader. They will come out to your sawmill and grade the lumber you have prepared. It is best to have the lumber all laid out ahead of time so that the grader can go through it quickly. They get paid by the hour, so the faster they can do their job the less it will cost you. Call some of the accredited bodies on the list at the ALSC website; they will have lists of graders that can help you. If you don't live in Wisconsin and you would like to see something like this in your state, contact your elected officials and encourage them to enact a similar program. You must decide whether it is worth it for your goals to obtain a grade stamp for your mill. You may decide that it is not worth the headaches involved. After all, you can still sell lumber for a multitude of other uses that do not require a grade stamp.